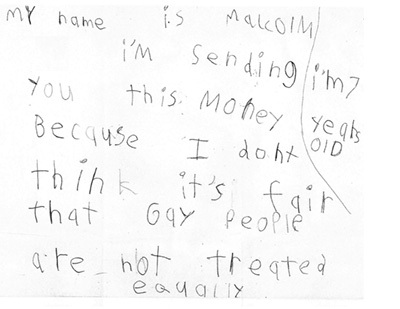 7 year old Malcolm’s mother gave him $140 – twenty for each of his seven years – to donate to the charity of his choosing. After hearing a story on the radio about the unequal treatment and discrimination gays and lesbians face every day in America, Malcolm’s mind was made up. The seven year old – 7 YEARS OLD, people – decided to split his donation between the Human Rights Campaign and Los Angeles Gay & Lesbian Center. What a guy! Attention homos, this little fella just trumped the heck out of you. If Malcolm is willing to help advance the movement toward equal rights for all gay and lesbian Americans, you should be too. Volunteer your time. Make a donation to your local LGBT non-profit. Make an It Gets Better Video. Just do something. Are you inspired by Malcolm’s donation? Thankful that the next generation of Americans is growing up in a world where gay rights are a no-brainer? Proud? Tell us how you’re feeling!